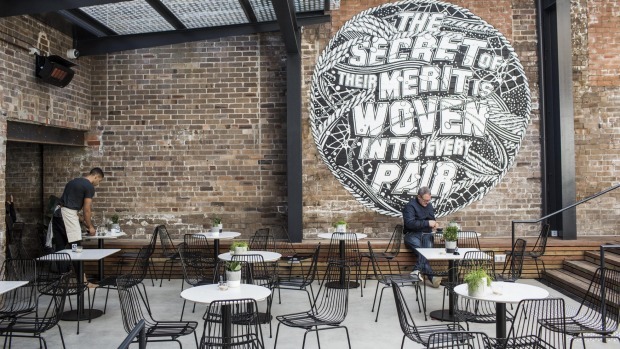 Henry Lee's bills itself as a concept cafe and collaborative space in the newly developed arts and culture precinct of 16 Eveleigh Street, Redfern. The first inkling of its conceptual, collaborative nature comes on arriving at its street address. It's an office foyer in a converted warehouse and, through the locked glass door, we can see people with great haircuts and lust-worthy glasses working at sylph-like computers in an open-plan office space. A sign next to a wall buzzer says Henry Lee's. It brings a lovely lady who refuses any apology for making her leave her desk to open the door and direct us down the stairs at the back and round the corner into an internal courtyard. It turns out the best entrance for the cafe is via Hart Street, at a back doorway signalled by a tiny sign above. The reward for finding the cafe is this bright, spacious courtyard setting, covered by a translucent cantilevered roof, designed by architect Atelier Andy Carson, which lets in plenty of light. There are lots of tables with black wire chairs that look as though they will squash flesh between their hard lines but are surprisingly comfortable. Combined with polished concrete, exposed brick and soft honey-toned wood, the overall effect is an airy industrial feel softened by potted succulents and a tall, leafy tree. We sit down to read the menu like a book. The deliciously worded Higgs Bacon Burger features LP's Quality Meats maple bacon, poached egg, smoked paprika and kohlrabi remoulade, coffee-infused bacon jam and cucumber pickle on a house brioche roll. 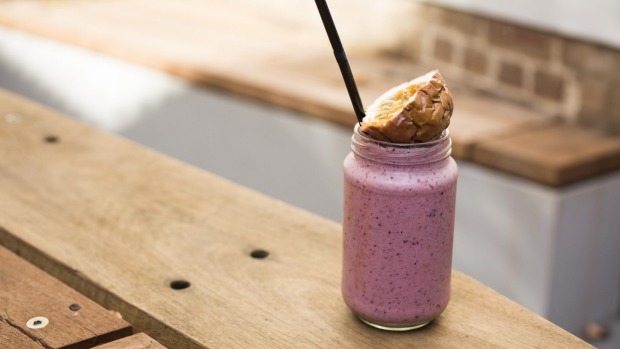 While that image spins in the mind, our eyes settle on the strawberry, balsamic and basil smoothie and the Red Chai Chai Chai with hibiscus, rooibos, honeybush, rose and rosehips. Both turn out to be top-notch, full of flavour and fresh ingredients. 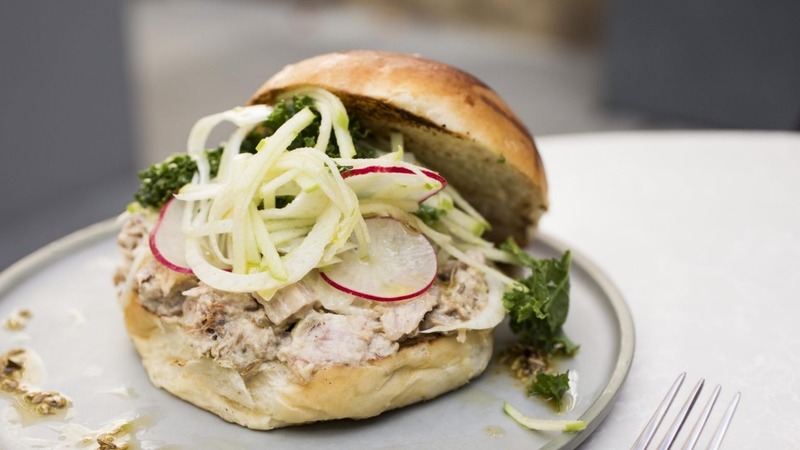 The Pork of Gibraltar is a bun sandwich containing slow-roasted pork shoulder baked in fennel seed and honey, with tarragon mayonnaise, fennel slaw, apple relish and pickled onion. I could eat three, no, four of these. The sweet, tender pork is balanced by the tangy slaw and pickled onion. It's a marvel. 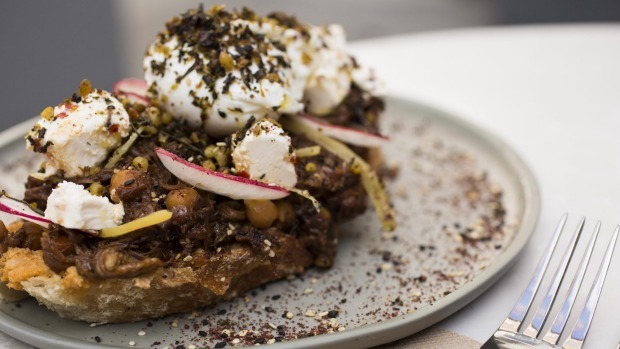 The Lyre – braised lamb shank and chickpea stew with marinated feta and poached egg - is a rainbow of exotic flavours but verging on too salty. The winner at the table is from the specials board, Jerusalem artichoke soup with sweet corn and parmesan rinds. Everyone has a taste, even the four-year-old and the 10-year-old who nod encouragingly before returning to their sweet potato wedges and croissant with gruyere and ham off the bone. Run by Kath and Aaron Devaney, formerly of Green Tangerine at Long Jetty on the Central Coast, Henry Lee's takes its name from the Nick Cave and the Bad Seeds ballad, which Cave sang with PJ Harvey. There are other nods to Cave and Harvey on the menu, such as the Polly Jean, Harvey's full name, with gin and citrus-cured salmon. Push the Sky Away porridge, a polenta porridge with salted pecan praline and poached rhubarb, is an ode to the 2013 Cave and the Bad Seeds album of the same name. Our coffees, made with Little Marionette beans, are strong and creamy, sparking a second round. Service is a delight, low-key but attentive and friendly. As we leave, my mother starts a conversation with staff about the chicken being cooked in the kitchen. Seconds later she is inside being shown a big vat of brown rice congee, to be paired with the chicken and mushrooms, and is handed a take-away cup to sample it. It sums up what makes Henry Lee's so fantastic overall. The food is excellent and innovative and customers are made to feel they are part of the process. A good concept and true collaboration.